The 47th annual conference of the Society for Pentecostal Studies recently met at Pentecostal Theological Seminary in Cleveland, Tennessee. Over five hundred scholars from around the world came together to discuss Pentecostal and Wesleyan contributions to Christian scholarship. 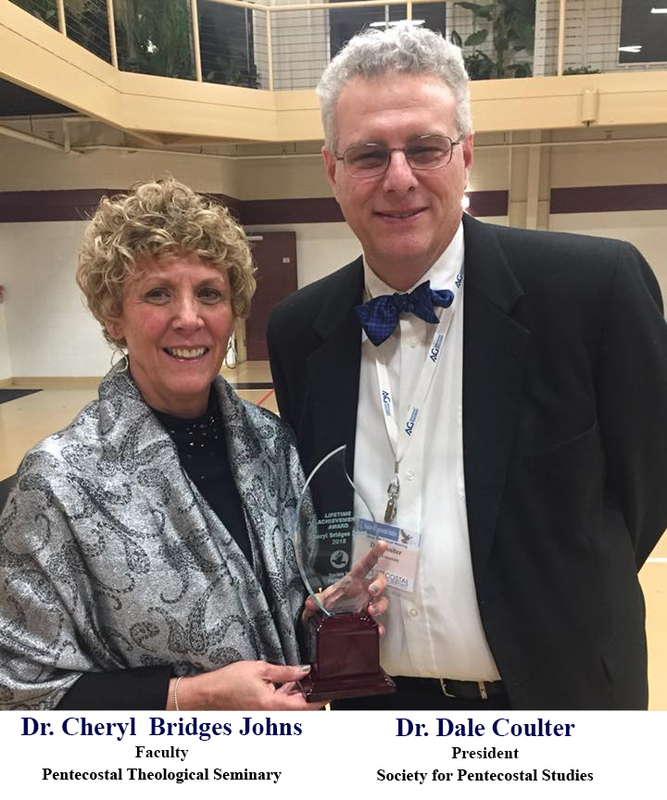 During the conference banquet, Dr. Cheryl Bridges Johns was presented with the society’s Lifetime Achievement Award. The award recognizes member Pentecostal and Charismatic scholars whose work has made a significant impact in scholarship and upon the movement. Dr. Johns was chosen because of her strong record of scholarship in articles and books, her work as an international ambassador of the Pentecostal movement among the Christian community throughout the world, and her significant impact within the Society for Pentecostal Studies. Dr. Cheryl Johns serves in the Robert E. Fisher Chair of Spiritual Renewal at Pentecostal Theological Seminary. She has served at the Seminary since 1986 and is the first female faculty member. She is a past president of SPS. Dr. Johns is the author of Finding Eternal Treasures and Pentecostal Formation: A Pedagogy Among the Oppressed. At the 2012 General Assembly, the Church of God honored Dr. Johns with its Distinguished Educator Faculty Award.